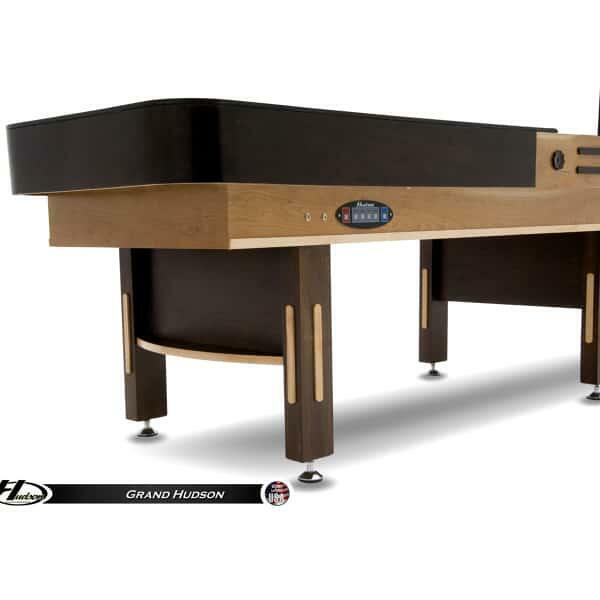 Mix affordable and professional quality with the 14' Grand Hudson Shuffleboard Table by Hudson. 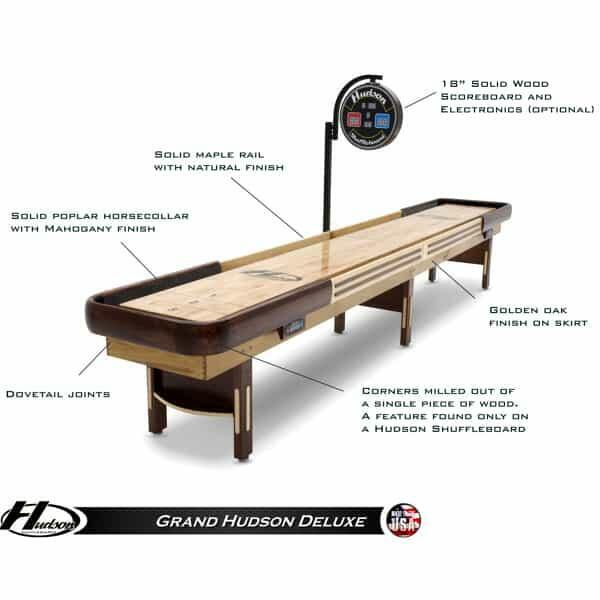 Hudson has carved a niche in the shuffleboard industry through quality craftsmanship without the added cost. 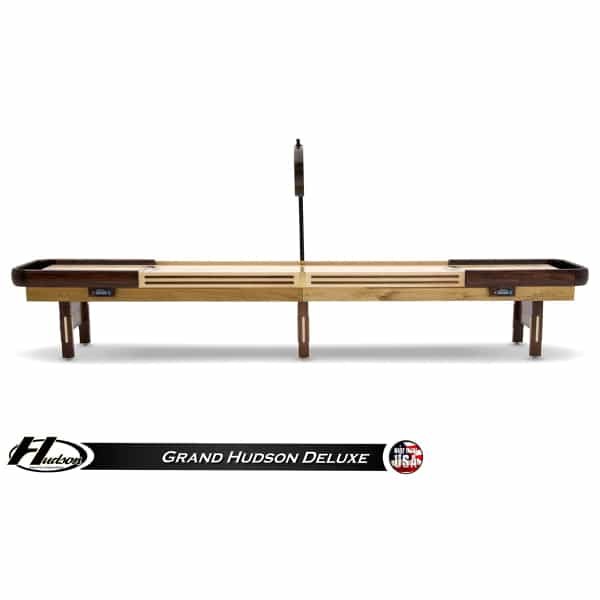 Each 14' Grand Hudson showcases playing surfaces that are 3" thick, made from kiln-dried Maple wood and covered with an ultra-durable polymer finish. This professional (several pros play on Hudsons, including 27-Time World Champ Billy Mays) shuffleboard surface offers a lifetime warranty, so the fun will continue indefinitely. 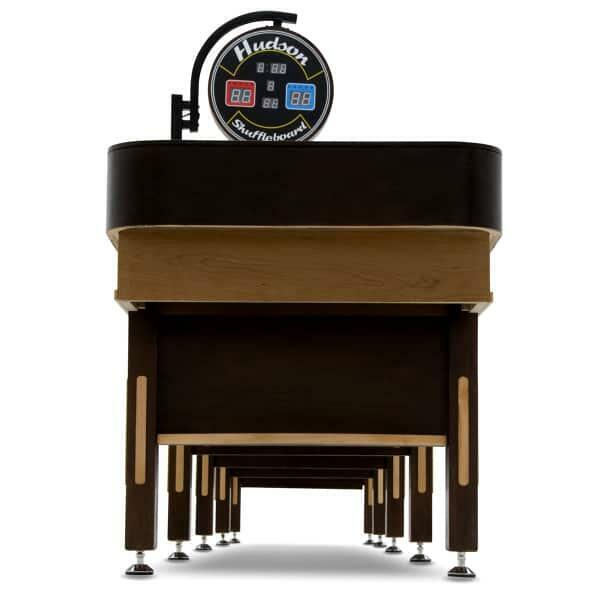 Hudson spares no expensive with the extra bells and whistles that come standard with this Shuffleboard Table. This model includes two bottles of speed wax/powder, eight playing weights, a playing weight storage box, protective cushions for the cradle (Gray, Green or Burgundy), five-inch leg levelers and one board wipe. Beauty also comes standard, with inlaid-maple trim on the legs, and a maple and walnut-finished cradle. Standard entertainment at country clubs and on the decks of passenger sea liners, now this classic game can be in the gameroom or basement! Contact Family Leisure today! Playing Field 12' 8" x 20" x 3"